The Danish people are extremely proud of their culture and have a fondness for their past. This is abundantly evident in the numerous shops that sell replicas of Viking jewelry and miniature scale models of a time long lost. Denmark is especially known for its clean designs in furniture and decor and its wide array of fine china. Occasions for gift-giving are frequent in Denmark. Christmas, as in the greater part of the Western World, is the main celebration of the year. The traditional gift-giver, not unlike Santa Claus, is Julemanden, who rides a sleigh pulled by reindeer. The Danish are very thoughtful and polite, so if you are visiting a Danish host, a thank-you gift is welcome though not customary. If you do decide to give your host a gift, bear in mind that extravagant gifts will only cause discomfort; the Danish are a modest folk. 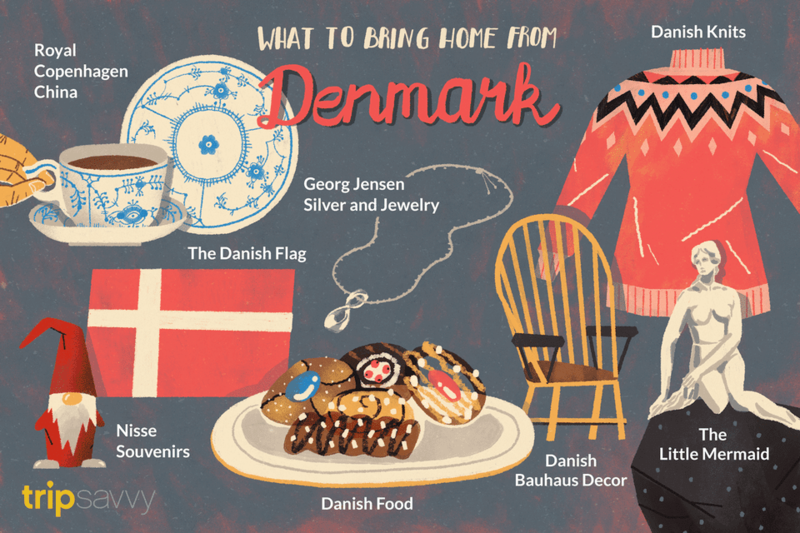 Most visitors to Denmark won't be giving gifts to Danes, however. They want to bring home memorable and special gifts to their families and friends and pick up some iconic souvenirs for themselves. Choose something that you can only buy in Denmark or is a true symbol of the country. Royal Copenhagen china has been in use since 1775 by the Danish. The official fine china in blue and white patterns is a fine to gift to anyone of Danish descent, as well as a nice take-home gift for the family or yourself. Fancy figurines and ornaments are also made by this historic Copenhagen-based china manufacturer. Established in 1853 by a former Royal Copenhagen employee, Bing & Grondahl still creates outstanding porcelain tableware and smaller household items that collectors will greatly appreciate. The Danish flag is considered to be the oldest continuously used flag in the world. In the spirit of Christmas, it traditionally features prominently in Danish Christmas tree decorations. The flag is red with a white cross. Georg Jensen started crafting the very finest Scandinavian silver jewelry in 1904, and it has become synonymous with Danish quality and style. The company makes both silver tableware and jewelry. Scandinavia is known for its sweaters made of high-quality wool that last for years. They keep you comfy and toasty in the cold winter months. Sweaters made in Scandinavia typically have beautiful designs knitted into them. The kringle is a proper local delight. It is a large, oval-shaped type of coffee cake that is formed in a ring and is a Christmas tradition. It has various fillings that include any type of nut or fruit. Other gifts of food include Danish butter cookies, local pumpernickel bread, Danish blue cheese, Kurry herring, Toms Skildpadde chocolates, all kinds of licorice-based candy, and Marzipan bars. Nisse looks like a leprechaun in a red hat. A Nisse is a Danish household spirit that cares for the family’s prosperity and well-being. Nisse ornaments come in all shapes and sizes, from miniature Christmas tree decorations to gigantic figurines. Plates and ornaments are also sometimes decorated with this little Danish elf. The Little Mermaid statue, made of bronze by Edvard Eriksen in 1913, presides over Copenhagen's harbor as a tribute to the fairy tale of the same name by Denmark's most famous author, Hans Christian Andersen. Take home a replica of Copenhagen's most famous statue or give it as a gift; it is an iconic symbol of Denmark. Danish modern furniture and decor burst onto the scene in the 1920s as part of the Danish design movement and is a strong reflection of the Bauhaus style. Its clean lines dominated midcentury modern style of the 1950s, and it retains its minimalist vibe. You can't take furniture home, but wooden trays and stainless steel tableware and decor items can easily be shipped. Jewelry is often reflective of a culture and history, and Denmark's is a Viking past. The Vikings were known for wearing jewelry, and it was also used to fasten clothing, so the Danes have a rich heritage to use as a guide.